Diksha mantras are given for the purpose of worshiping, attaining, and seeing one’s desired istadevata, Radha-Krishna. The diksha mantras received from Sri Guru are so powerful that by chanting them a sadhaka can achieve a post of unlimited wealth, power and influence; travel to any planet in the universe; enjoy eternal bliss; attain Krishna prema; and see Radha and Krishna face to face, sakshad darshana! Gaudiya Vaisnava mahajana acharya Sri Sanatana Goswami proves this point in his magnum opus titled “Brhad Bhagavatamritam” by narrating the spiritual odyssey of a cowherd named Gopa-kumara who lived in Vrindavana five hundred years ago. One day when Gopa-kumara was playing by the Yamuna, a vairagi sadhu noticed the boy and called him to his side. Being inspired by the Paramatma to give diksha, the sadhu whispered the Gopala mantra three times in Gopa-kumara’s right ear. After giving diksha, the sadhu experienced divine ecstasy, started crying and ran away. Feeling amazed and grateful by the transforming experience, Gopa-kumara began sincerely chanting his diksha mantra while praying to Thakuraji Sri Sri Madan Gopal for His divine mercy. Just by chanting his diksha mantra (Gopala mantra), Gopa-kumara got the power to travel through India and beyond the earth. 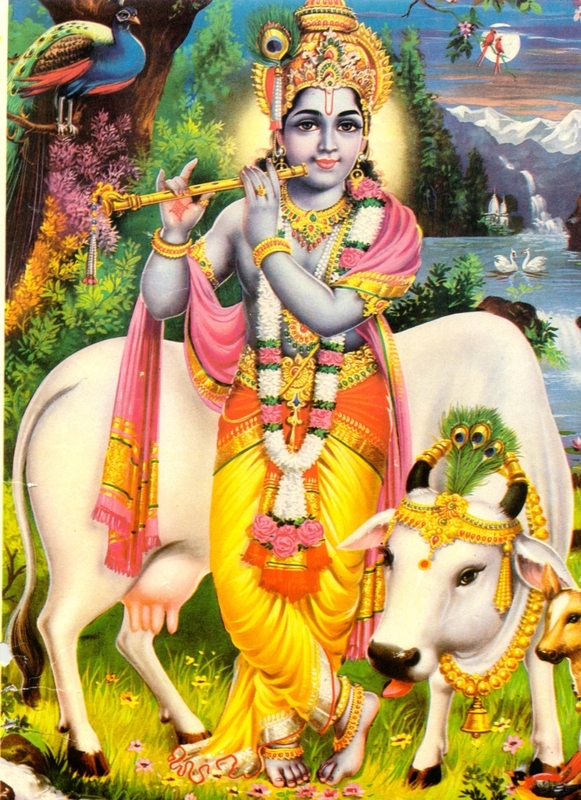 Gopa-kumara’s diksha mantra chanting carried him to Indraloka, Brahmaloka, Shivaloka, Vaikuntha, Ayodhya, Dvaraka and finally to Goloka Vrindavana. During his travels, Gopa-kumara spoke a very important verse regarding how to properly chant diksha mantras. Gopa-kumara chanted with fervor, an intense eagerness to achieve mixed with anxiousness (akulah). Like all of us riding on the uncontrolled chariot of material desires, Gopa-kumara had desires. But Gopa-kumara had only one all-consuming enthusiastic desire driving his mind and life forward (manah ratha): To see God, Sri Sri Madan Gopalji. This is called sankalpa purvam and jata manah ratha, to mentally, before chanting, fix one’s attention on one’s cherished desire. Then EACH AND EVERY TIME you chant your diksha mantras, you should, like Gopa-Kumara, pray and meditate upon your sankalpa and the meaning of the mantra while fervently chanting it with an “an intense eagerness to achieve your goal mixed with anxiousness (akulah). If one chants in this way as taught by the humble Vrajavasi cowherd, Gopa-kumara, then by the unlimited power of the Gopala Mantra and Kama Gayatri, the primary Gaudiya Vaisnava diksha mantras, a sadhaka will surely obtain darshana of Sri Sri Radha and Krishna. Diksha mantras ki jai! Mantra Guru gana ki jai! Jaya Jaya Sri Radhe!